Yesterday my prima asked me for a vegan recipe for empanadas. I had to think long and hard because the meatless empanada recipe I have on my blog is actually vegetarian. I recently learned that Goya’s empanada discos indeed have whey (milk) in it. So, this means you’ll have to either make your own discos, or get a little creative in the kitchen. I chose the latter. I created empanadas using sweet plantains and I think I can say they are better than the Puerto Rican, traditional way of making these. There is the mouth-watering merge between the sweet and savory that will make your mouth excited (and maybe a little bit confused). Filling of choice. I used my homemade vegan picadillo. Note: if you don’t want to go through the trouble of making the picadillo from scratch, there are meatless alternatives to ground beef. Use that! Or stuff the empanadas with whatever you choose. There’s no hard rule for this. Prepare the filling. I recommend my picadillo recipe, but feel free to used meatless alternatives to ground beef. Cut plantain into three chunks, with skin still on. Boil plantains in water for 10 minutes. Remove plantains from water. Transfer to bowl. Peel off skin. Add a pinch of salt. Mash plantains. Slowly add and mix the 1/4 cup of flour into the mashed plantain. 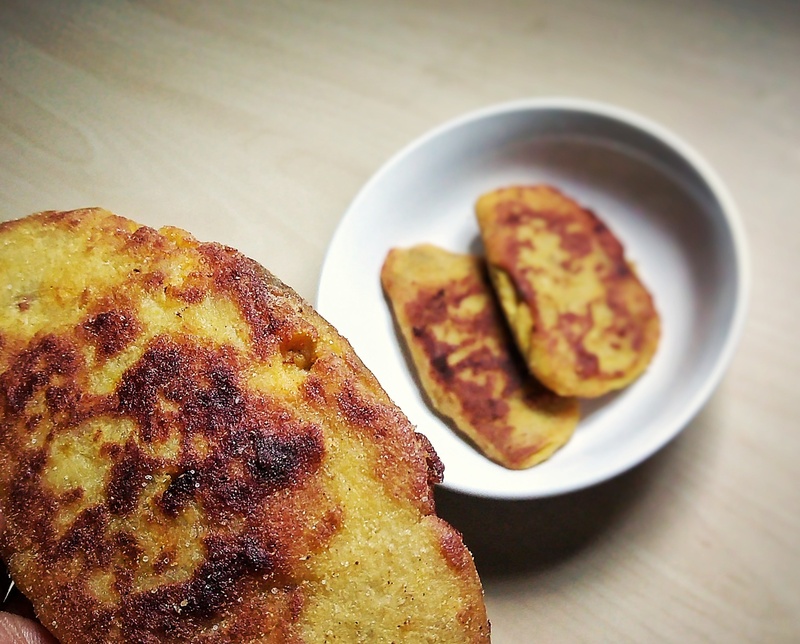 Mix the plantain and flour until it becomes firm enough to handle. You may need to add less or more flour into your flour (eyeball it). On a chopping board, spread about a teaspoon of flour. Make sure your hands are dry and cover hands with flour for an easier handle on the empanadas. Remove a chunk of the plantain mixture. Make a ball. Then flatten them out into a round shape on the chopping board. Add about 1 tablespoon of the filling into the empanada. Make sure not to add too much. You want to be able to close the disco. Fold disco in half and seal the edges. In a small pot, add about 1 cup of oil over medium heat. When the oil is hot, add the empanadas. Cook for about 1-2 minutes on each side, or until golden brown. If you want a meatless (vegetarian) recipe using Goya’s discos, make sure to check out my Epic Empanadas blog post!